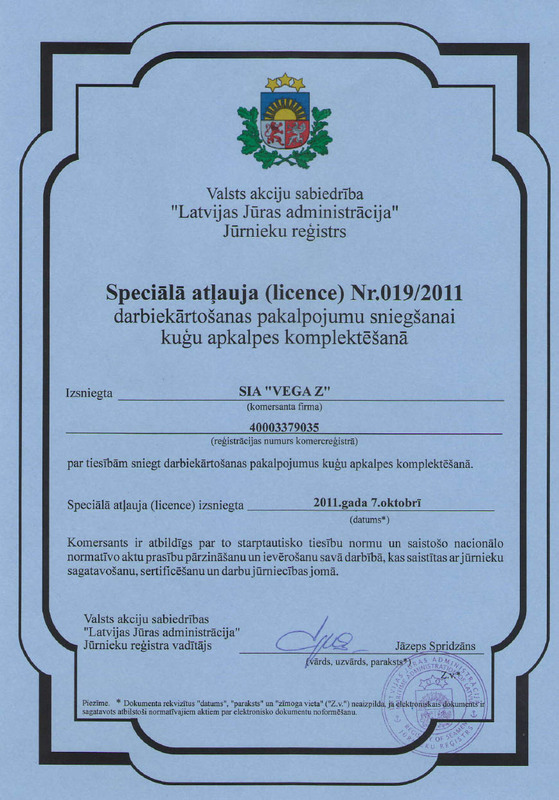 Vega-Z are a fully registered company working under the relevant laws of the country. Vega-Z, has been established to provide high quality Crew Management, Manning and Training Services at affordable cost for any organization requiring specialized Seafarers for all types of Ships. Our people, having a 25-year experience in this area of shipping business in the maritime, are ready to provide state of the art services to both Shipping Companies and Seagoing Personnel. Our headquarters are based in Latvia and cooperating office branches in Russia. Vega Z aims to become the leading supplier of quality and competent seafarers in the Maritime Industry. Vega Z is flexible on Crew Management Services. We may provide Full Services. We select seaman having good performance, professional knowledge, personnel human attitude, excellent English as well self - motivations. Company supplies well training and highly motivated sea staff to our clients. Our main crewing office located in Riga and cooperated branch offices in Russia (St.Petersburg and Kaliningrad). Our crewing department provides stringent check and monitoring of employment/sea going history, certification, training and medical records. We arranging ISM Code courses, ISPS code certification, SOLAS training including training courses in IMO training center in Riga. Our Crew Management scheme has been specifically designed to address all operations related to the Human Element onboard a vessel, which is being consisted by a broad range of activities like Crew selection, screening, interview, recruitment, training, briefing, deployment, payment, repatriation, de-briefing, etc. Our Team is able to provide Crew Selection Solution from various Countries depending on the Vessel’s needs (Type, Trading Area, Seafarer Selection Criteria etc.). Effective communication with Port Agency, Travel and Crew Agencies is the key for smooth and low-cost Crew Changes. Vega Z maintains cooperation with Travel Agencies throughout the World and providing cost-effective, 24-hour Ticketing service. Мы находимся практически в самом центре г. Рига. Данный веб-сайт использует файлы cookie для того, чтобы сохранить данные на вашем компьютере. Если вы продолжаете работать с этим веб-сайтом, мы предполагаем, что вы соглашаетесь с использованием файлов cookie на www.vegaz.lv.